This simple security device can be installed in only minutes and yet is powerful enough to protect your home or office from an intruder. It can be placed an a table or hung on the wall. It will detect motion from up to 30 feet away. 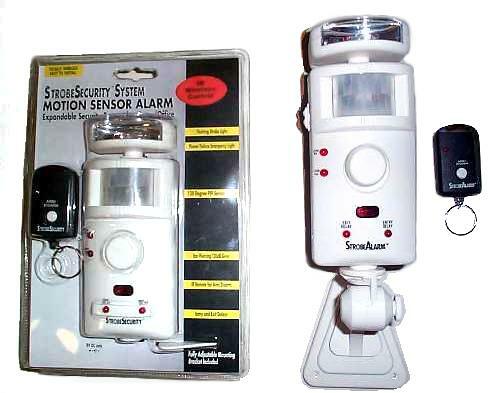 If not disarmed by the owner using the remote control, it will respond with an ear piercing alarm and blinding strobe light which will scare off the intruder and alert others to your need for help. A switch on the side of the strobe light allows the light to remain on and to be used for emergency lighting during a power outage. Ideal security for a home, retail store, office, dorm room, or hotel room. Includes an adjustable mounting bracket. Requires one 9 volt and four AA batteries or an AC adapter.